I’m always looking for great pizza places. Always. Lucky for me, Grand Rapids has a couple of really great artisan pizza places that I visit quite often. It’s a little more expensive, but the pizza is so much better than the typical pizza place. 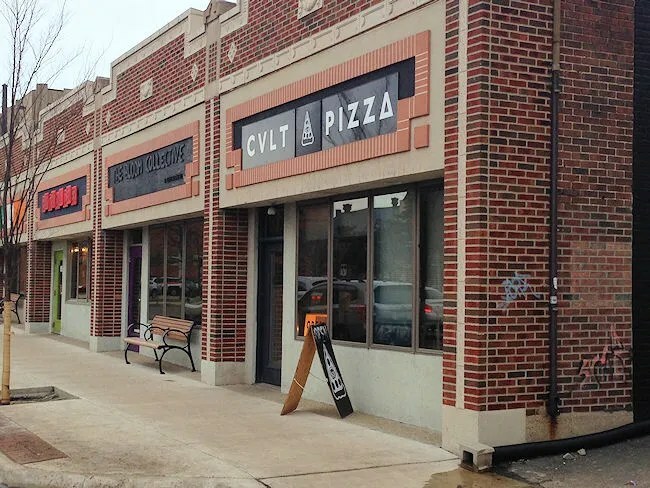 This weekend, I found another one of those great places when I finally pulled up the website for Cvlt Pizza and called in an order. The small, farm-to-crust pizza is located on the edge of downtown Grand Rapids near the corner of Jefferson and Fulton. It’s a very small shop that turns out incredibly tasty pizzas. The menu has a little more than pizza. They also do a couple sandwiches, calzones, and pizza rolls, but it’s the pizza that drew me in. The ingredient list is always changing do to the fact that everything is sourced here in West Michigan. The menu is divided in to a meat list and a veggie list as well as options for a plain cheese or a locally sourced pepperoni plus one specialty pizza known as The Annihilator. 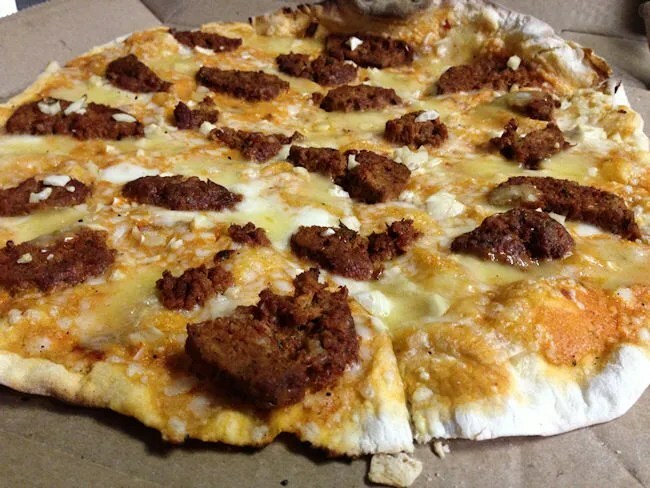 I put in an order for a 14 inch #1 off the Meat Pizza list The super thin crust pizza is topped with Atomic sauce, homemade meatballs, caramelized onions, and roasted garlic with cheddar cheese plus their own mozzarella/provolone cheese mix. It took about fifteen minutes for the pizza to cook and it was boxed up and ready by the time I got there. I paid the $18 with cash, but they have an iPad for a cash register which makes me think they take credit as well. I got back to work and popped the box open. The pizza was a super thin crust that needed to be eaten New York style. I ripped a large slice away from it’s brethren, snapped the crust in half an dug in. I had opted to leave the onions off, so the dominating flavor was the fresh, chopped, roasted garlic. I was expecting something more along the lines of a roasted garlic paste on the crust or something, but this pizza contained actual pieces of garlic. It made for a delicious pizza, but I was still burping garlic hours later. 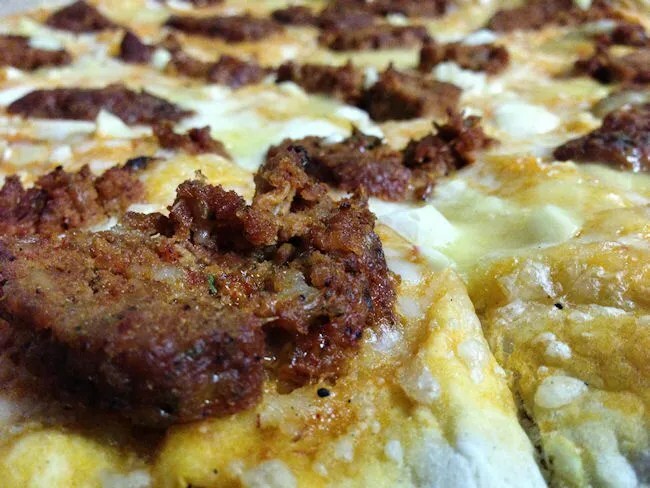 The other great thing about this pizza was the home made meatballs. The sliced meat was a little spicy, had a fennel flavor to them, and were still very moist and juicy. These were meatballs that I could just….keep…..eating….. 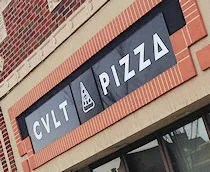 I have driven by Cvlt Pizza many, many times, but I always assumed they were more of a vegan place like the nearby Bartertown Diner. I can’t tell you how excited I am that I finally checked this place out. The pizza is fantastic…I mean really fantastic…and while it’s a little expensive, that extra expensive is worth it when you bite in to the pizza and taste that local sourced goodness.